Wherever plastic foil is processed from a reel, the winding operation leads to a high static charge. This charge attracts dust and dirt which contaminates the final product and can even make it unusable. 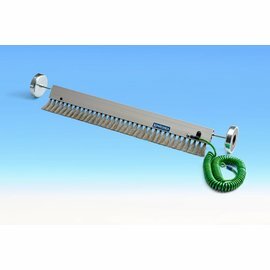 The Kinetronics antistatic brushes from the Laminator series effectively prevent this electrostatic charge. They reliably discharge the electricity to ground. Free of static charge, the foil runs flat off the reel, which contributes to a smoother finish during the laminating process. The ultrasoft antistatic brushes are ideally suited to all kinds of foil. There is no risk of scratches or damage. For optimum results, one brush each is required for the top and bottom of the foil. The StaticWisk brushes of the Laminator series can, for example, be clamped to a foil laminating device directly between the jaws of the machine frame. To secure them, simply unscrew the screws included in the scope of delivery from the ends of the brushes until the magnetic feet are firmly positioned against the frame of the machine. Each StaticWisk brush is supplied with a 3.5 metre long ground cable, which reliably grounds the static electricity. The cable is supplied with a cable lug for simple installation. The antistatic brushes consist of synthetic fibres and must not be used above 150 degrees Fahrenheit. Of course, the StaticWisk brushes are not only used in laminating units. Wherever static electricity causes problems, these high-quality brushes represent the optimum solution. Special lengths are available at any time.